I regularly get comments and emails from my readers asking how to incorporate a piece of furniture that they’ve either inherited/rescued/picked up at a thriftstore. Oftentimes, the piece itself is beautiful but might not initially appear to blend well with their existing style. 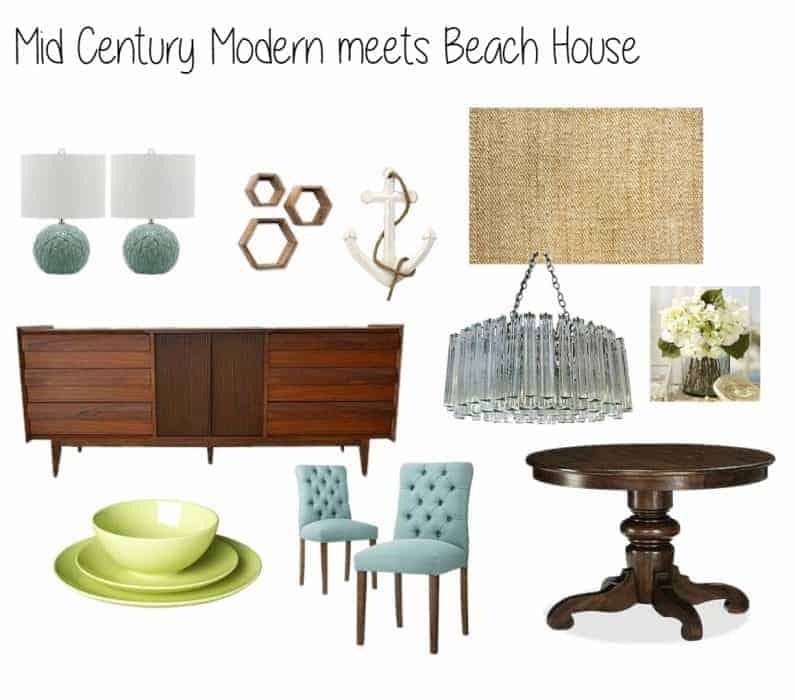 Recently, a reader challenged me to design a mood board to show how Mid-Century Modern furniture is perfect to mix ‘n’ match. What a perfect opportunity to share my golden rules to successfully mix and design styles! Today I’m going to show you how to take a mid-century credenza dresser and incorporate it into three very distinct styles – neither of which naturally have a mid century aesthetic. I’m choosing this credenza because mid century furniture is SUPER popular right now (I even have a similar piece in Cian’s nursery that I refinished) thanks to shows like Mad Men. You might not realize it but this era lends itself to an eclectic mix of furniture capitalizing on the mish mosh effect. I’ve chosen a dining room setting to stage but the same 3 principals (my design formula or “rules”!) will apply to any room in your home. If you loosely stick to this formula you can’t go wrong. 1. Mix and match metals, colors and textures but nothing should stand alone. I try to have each color and metal appear at least twice so that it seems intentional and cohesive. 2. Ground your design with something natural – be that some greenery, wood or even a jute rug. 3. Have fun and don’t be afraid. What’s the worst that can happen? 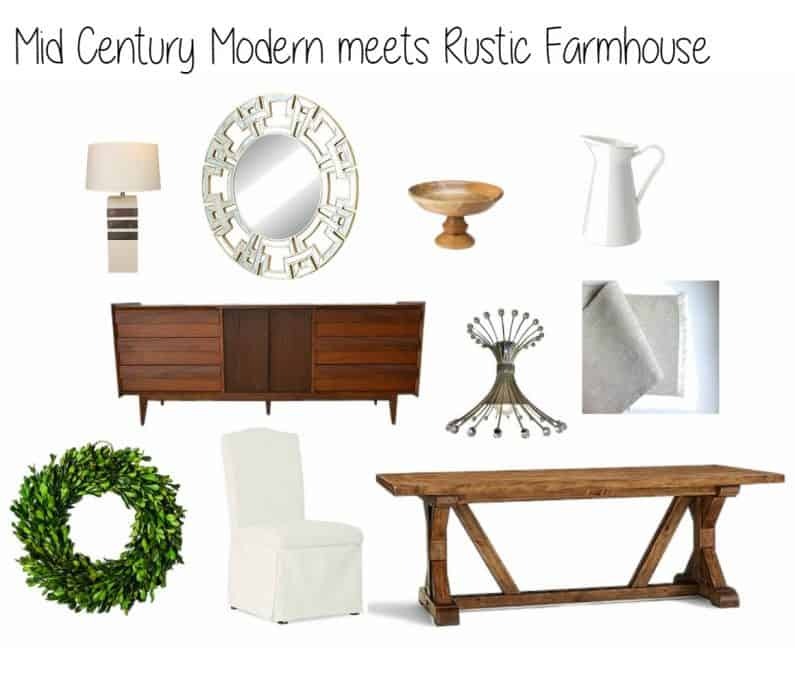 My first example of a staged dining room is based around someone who loves the Rustic Farmhouse look. He or she has already purchased an expensive table and chairs but really wants to incorporate a beautiful mid century dresser, lamp and light fixture into the space. You can see how the wood element is clearly repeated between the table, dresser and decorative bowl. The metals repeat in the light fixture, lamp and mirror and the space is grounded with some natural elements in the form of the covered chair, boxwood wreath and linen table runner. Think a beach house can’t pull off a mid century piece of furniture? Think again! 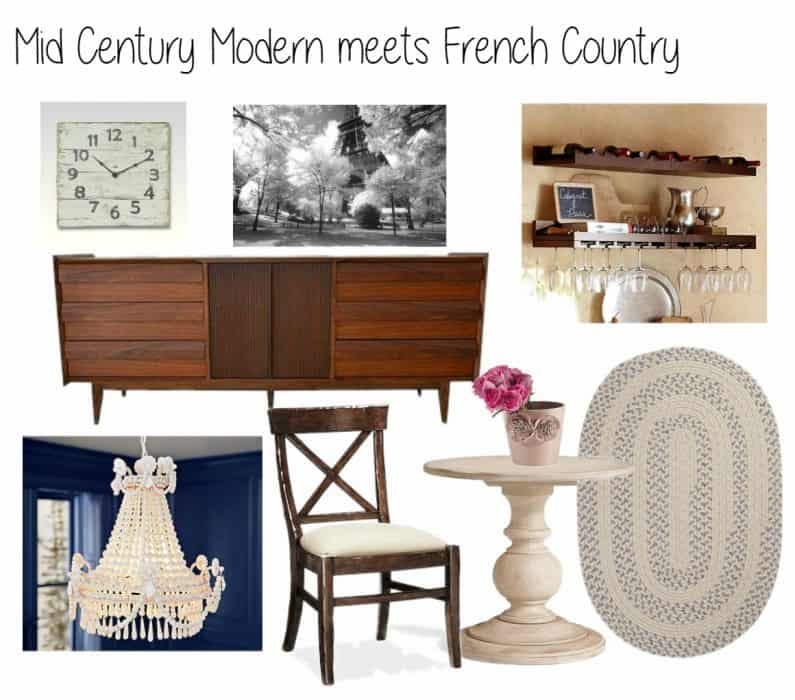 In this mood board both the dresser and chandelier are mid-century pieces. I love designing mood boards. It’s such fun :-) Again, I’m following my formula – the blues and greens appear twice (although the chandelier mimics the blues too), there’s two wooden elements and the space is pulled together with the addition of a jute rug. There’s lots of texture going on here too – from the tufted chairs, to the lamp bases and finally to the light fixture. Texture is good! Isn’t that cute? I found this one the most difficult to do – mostly because this design aesthetic doesn’t come naturally to me. It’s tempting to go over board with “whitewashed” colors here – whites, beiges, light grays – so this space really needed another wooden accent to help the dresser mesh. Both the shelves and side chair really accomplish that without making the space feel too heavy. Well, that’s it for today. This was a fun challenge for me to take on and hopefully some of these mood boards have inspired you to add some mid-century pieces to your home! My design rules have not let me down yet so I hope they will work for you, too! And of course,if you’re stuck for ideas on how to incorporate a piece of furniture, feel free to drop me an email or a comment!